Another Vincent Van Gogh biopic, but with a synthesis of Willem Dafoe in the lead role and Julian Schnabel behind the camera, who can resist? Despite being a legend of the New York art world, Schnabel’s cinema comes under criticism for leaning too middle-brow. But these artists are always fascinating beasts, constantly examining how artists communicate the indescribable in their head into some kind of language. Think of Jean-Dominique Bauby in The Diving Bell and The Butterfly (2007) learning to write by blinking. Schnabel turns here to perhaps the most famous artist ever, who had to create an entirely new language to communicate the things that he saw. Schnabel and Dafoe do a great job of contrasting that interior genius with a man who can barely speak to others, who is so overwhelmed by his visions of nature that he appears to be entirely mad. Willem, a 65-year-old in the role of a man who died at age 37, plays the part as myth. And perhaps that casting inherently allows us to see heretofore unseen shades of the man, his old soul, and Willem’s youthful exuberance. It’s a part that allows the actor to show off everything that makes him such a beloved character actor, the wild energy, the sadness behind his eyes, the controlled physicality. It does a service to both actor and subject, and one hopes that the Academy goes the same way as Venice and gives Willem the Best Actor Award for a role that works perfectly with his persona. I did have to laugh at the appearance of the postman Joseph Roulin and his gigantic beard, though, ‘May I paint you?’ intones a shitfaced Vincent. Willem gets strong scene partners, in the form of a moustached Oscar Isaac as Paul Gauguin, Mathieu Amalric as the famously painted Dr. Gachet. A stand out scene towards the end has Willem sparring with Mads Mikkelsen as a priest, who charges that Van Gogh’s painting is an insult to God. Schnabel shoots the process of painting with an urgency. These scenes are so vibrant, the paint pops off the screen as though in 3D – what might Bi Gan do with this material? There is an effort to relate Van Gogh’s style to photography, through the abstraction of rain on a window. 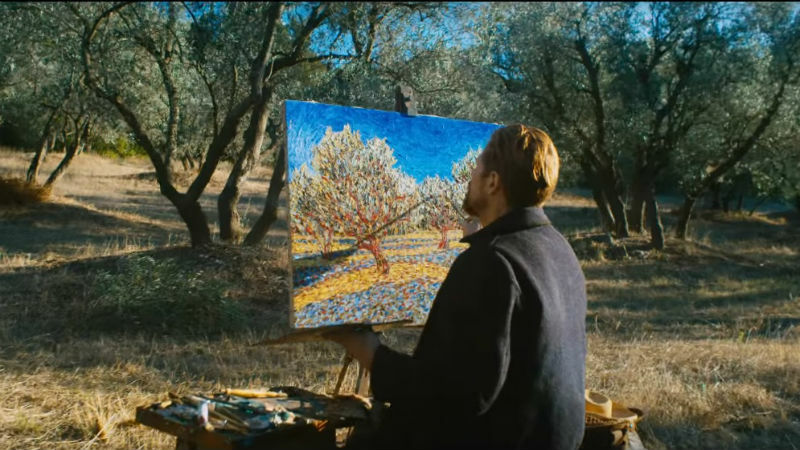 With coloured lenses and hurried camerawork, Van Gogh’s form becomes the film form. So how well does this fit into the Van Gogh canon? 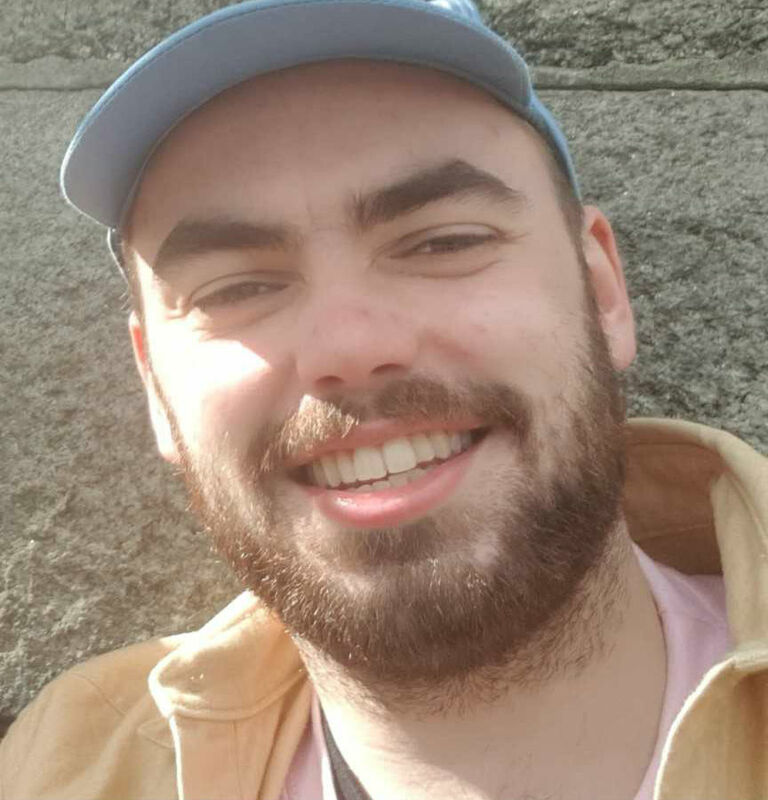 The recent Loving Vincent (Dorota Kobiela/ Hugh Welchman, 2017) is a glorified kids film, that plays to the silver screen crowd, and these American takes – including Robert Altman’s Vincent and Theo (1990) and Minnelli’s Lust For Life (1956) – are too respectful and stately to really capture the genius. More successful are Akira Kurosawa’s Dreams (1990) and an old episode of Doctor Who, which treat the artist in terms of his influence and confront our wish to reach back to him. This lands somewhere in the middle. 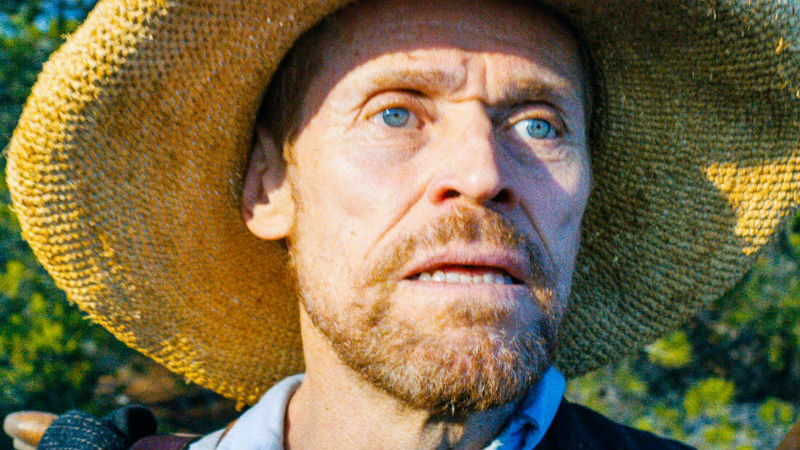 For despite the formal tics and a game Dafoe, At Eternity’s Gate still follows the expected beats of a Van Gogh biopic. The Ear. The kids throwing rocks. The insane asylum. The notion of tortured genius isn’t really challenged by Schnabel, who doesn’t really bring anything new to our understanding of events surrounding Van Gogh. It’s a straightforward depiction of his last years, which may be enough. Its pleasures are varied, and the Dafoe performance is wonderful, but this is a tribute act, rather than an earth shattering new take. At Eternity’s Gate showed at the International Film Festival Rotterdam,when this piece was originally written. It is out in UK cinemas and also on Curzon Home Cinema on Friday, March 29th.